This is the first time I have ever seen a movie from director Ridley Scott, and quite frankly, I have mixed feelings about his style of filmmaking. His latest work is Exodus: Gods and Kings. Luckily, it’s not as bad as I have read (mainly due to 20th Century Fox being the film’s distributor), but that doesn’t mean they don’t take any liberties with the story. 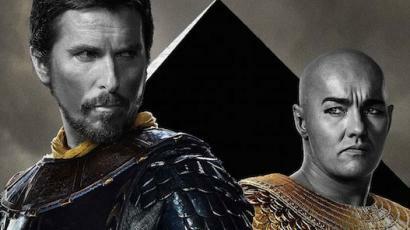 The first act follows the brotherly relationship between Moses (Christian Bale) and Ramesses (Joel Edgerton). Like in the Biblical story, Moses has been raised by royalty, and is the favored son of both brothers. Moses later realizes that everything he is is a lie. He is actually a hebrew who was sent to the Egyptian pharaoh in order for him to not be fed to the crocodiles. That’s basically all you need to know about the plot of the first act. The second act is where things get really bizarre. In the film, God takes the form of a young pre-teenage boy, which I found to be pretty bizarre, but not that surprising. Since Scott is a devout atheist, he thought he felt the need to insult the very audience this film is aimed at by doing this stunt. However, as shocking as it may sound, that didn’t insult me. I immediately thought of the 2004 CBS drama Joan of Arcadia, in which God can disguise himself as anyone, whether it may be a newsman, a young boy, or anyone for that matter. The plagues though, outside of how the waters of Egypt turned to blood and how the parting of the red sea took place, were very accurate to the story. The best part of the movie though was the epic battles, especially in the opening sequence. …and that’s basically all I have to say about the film overall. There’s no doubt that Exodus: Gods and Kings does take a lot of liberties with the story, but that doesn’t mean it wasn’t good. It wasn’t great either though. Overall, if you’re wanting to see Exodus at all, I say wait for it to come out on Netflix or Amazon. In the meantime, if you’re wanting to support Fox News’ parent company at all this holiday season, wait for Night at the Museum: Secret of the Tomb to come out.